With EzDataMunch’s Education Analytics solutions, educators can draw real meaning from raw data. Give the Board and President’s Cabinet new insights using easy-to-build dynamic dashboards that create context for any user. EzDataMunch Education Data Analytics Apps seamlessly connects to your data sources, allowing dashboards to be updated in real-time. From data to insights in less than a week, business users can start using stunning education dashboard and analyze data like never before! 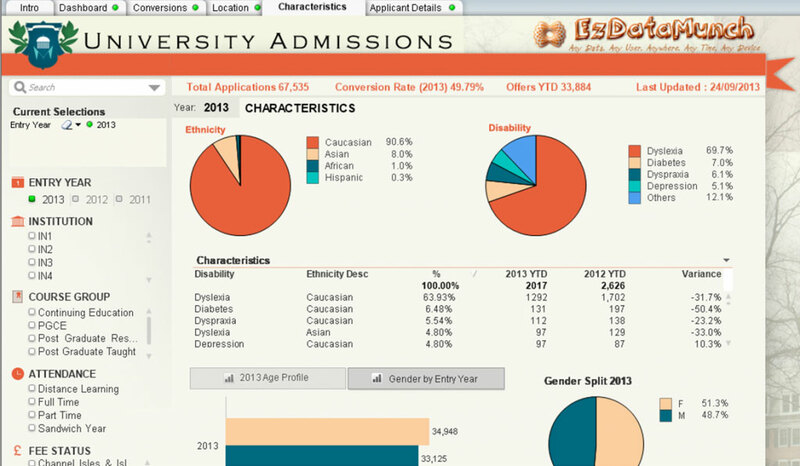 Increase enrolment, track performance and augment finances by using our education analytics dashboards. Find trends and statistics important for schools and colleges. Spend less time creating reports from plethora of data available and focus more on critical tasks. Analyze metrics such as student performance, attendance, classroom behavior and understand reasons for students drop out. Use predictive analytics in education for future dropouts and take corrective actions. Track teacher’s performance and ascertain training requirements to ensure quality outcome. Manage workforce within budgets and allocate funds appropriately. Simplify application process and enhance student experience. Increase student recruitment per year and maintain education quality. Manage budget and maintain student teacher ratio as per requirement.